Thread: WET ONES *CONTEST* WINNER ANNOUNCED! Congrats to Laurensmom our winner!!! Please email in your mailing address to Leslie@londonmoms.ca and they will be sent directly to you! Thanks! A Few Tips from Wet Ones® Antibacterial Wipes on keeping parents and kids germ-free! Germs can be spread all year long but with cold and flu season around the corner, the more precautions taken to keep kids germ-free, the better it will be for the whole household. By following these hygiene tips, you can help keep germs out of your home and help keep your family healthy! 1) Washing hands with soap and water is the single most effective way to kill germs and keep hands clean. If there is no soap and water available, give hands a good scrub with Wet Ones® Antibacterial Wipes: keep some in the kitchen, diaper bag, car and lunch boxes so that you’re never without them when germs strike. They kill germs and wipe away messes all with one easy wipe. 2) Groups of kids are prone to spreading germs. Help prevent germs from spreading by wiping down toys after play dates using hard surface disinfectant wipes meant for cleaning commonly touched areas in your home. 3) Bring Wet Ones® Antibacterial Wipes to the kid’s soccer game, horseback riding lesson or drama class and pass them around – the other parents will thank you! 4) Use Wet Ones® Antibacterial Wipes on yourself & the kids when you finish grocery shopping– few things are as germ-ridden as a shopping cart handle! Based on laboratory microbiological testing, Wet Ones® Anti-bacterial Wipes are effective at killing germs, but they also clean away dirt and messes, and won’t dry out skin like alcohol-based hand sanitizers. Use Wet Ones® Antibacterial Wipes before snack time or other meals, after play dates, and when leaving public areas such as malls or sporting events. Thanks to our friends for providing three awesome prize packs! 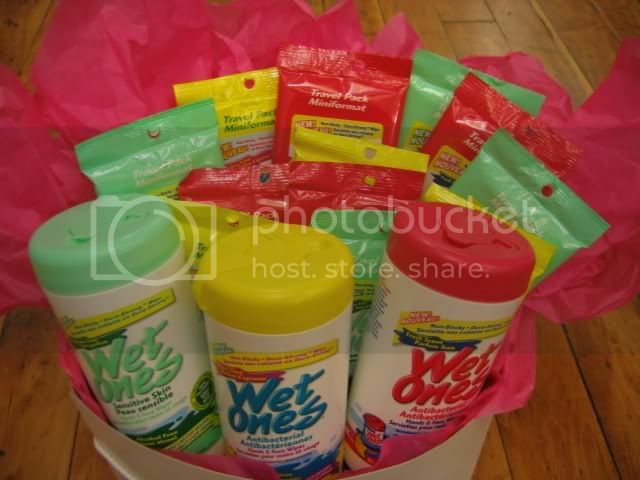 Please send your entry to contests@londonmoms.ca and be sure to include Wet Ones in the subject line. Last edited by Leslie; 02-17-2010 at 10:01 AM. Whoa that is one huge whack of Wet Ones!!!! Awesome! Thanks Wet Ones and Leslie! We have had a whole lot of contests latley! Leslie -- you can go on 'fake' vacation anytime!! But really... go enjoy FLORIDA! Thanks. I could use this with all the sticky fingers I have here. No questions to answer? Or am I not seeing it?